Hello everyone! I want to take a moment to introduce myself. My name is Jodi Bird, I am 35. My husband and I have been married for 15 years and have 6 beautiful kids. My family and religion is very important in my life. I always turn to the Lord for guidance to Choose The Right and be an example to them. I want my children to grow up and know that they are a Child of God and he will help and guide us through all of our trials. I know that if we strive to live a righteous life my family will return to live with him together for all eternity. I studied Fashion Design in New York City at the Fashion Institute of Technology. I specialized in Evening and Bridal. I love to work on wedding gowns and become a part of that special day! 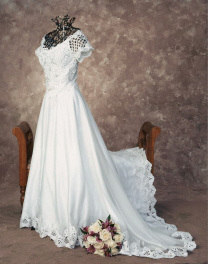 For the first 3 years after college I designed and made several custom wedding gowns. I then took a break to focus on raising 6 beautiful kids! Since 5 of them were girls I knew I had to get back into design! With them in mind I jumped right back into design about 4 years ago to market a basic girls line of clothing that was a boutique style but at a reasonable price. I have been so blessed that my business has grown and been successful for me and my family. I currently have my designs in 7 different boutiques and was able to open a small Kiosk in our mall for the holidays! I hope that you will find my designs simple but yet unique. I change my fabrics so often that you are almost getting a one of a kind design and don't forget that all items are made in the USA by me! I welcome your questions and feedback, so please feel free to send me an email or leave feedback on facebook! Thanks for getting to know me and I look forward to working with you!